Local MP and Chair of 4th Denton (St Anne’s) Scout Group Andrew Gwynne has attended a community fun day to show support for the growth of Scouting and for getting more adult volunteer to support Scouting in the area. Greater Manchester alone has 18,000 Scouts yet still has 1,100 young people on the waiting list. 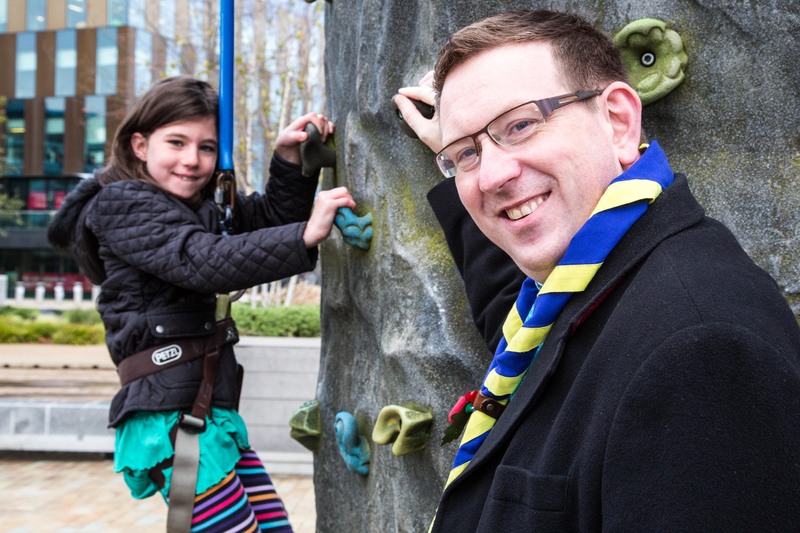 The day saw hundreds of local residents descend on MediaCity Piazza on Salford Quays, taking part in demonstrations of Scout activities, a climbing walls, BMX tracks, live music games and much more. “Demands and pressures of modern life often mean it’s harder for people to find time to volunteer, so for some time now the Scouts have offered volunteer roles in such a way that adults can get involved flexibly, similar to the way that the Duchess of Cambridge is supporting Scouting. The role I’ve just agreed for myself in Manchester is shared between four adults to make it work. Flexibility in volunteering is the way forward”.